What do kiwis, helicopters and pterodactyls have in common? If the above is all Greek to you, don’t worry — just wing it. Why? Because the root word for wing in Greek is pter. You’ll find it hiding in helicopter and pterodactyl. And, in its longer form pteryx, in the official name of our beloved kiwi, apteryx. Now it may strike you as odd that our flightless national bird should be any sort of relative of the mega-winged prehistoric predator, let alone of the rotor-bladed mechanical whirlybird. You may be thinking that our little nocturnal groundgrubbing stickybeak could hardly have less in common with these two high-flying giants. And there, I’m afraid, you’d be dead wrong. There’s a secret link, you see. In the same way, we get apteryx — without wing — flightless. As for the helico part of helicopter, that’s Greek for spiral. Science buffs will know it in its other form, helix. 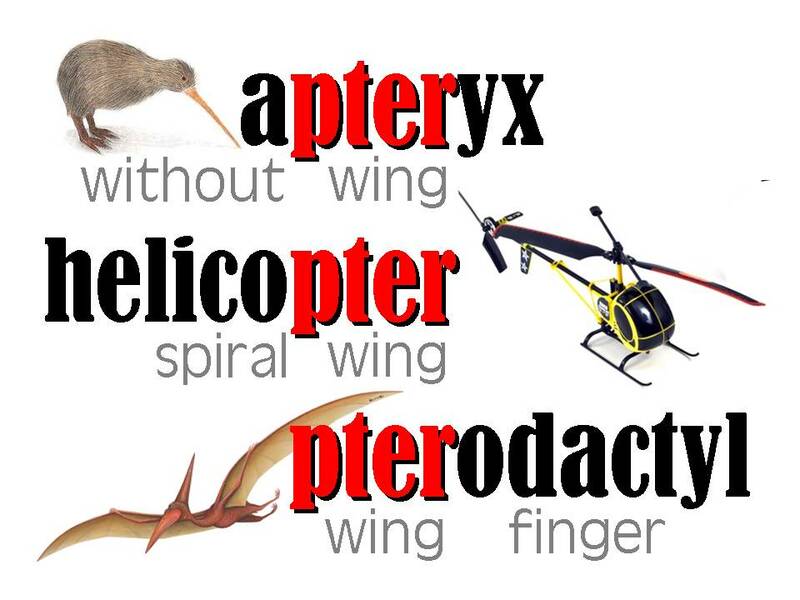 Oh, and the dactyl in pterodactyl means finger. Who said English was the only crazy language?